Pictured left to right: back row: Coach Doug Peirick and Coach Dave Luecke. front row: Ray Steinhoff (father), Rachel Steinhoff, and Ruth Steinhoff (mother). By Kyle Quick - New Haven, Mo. 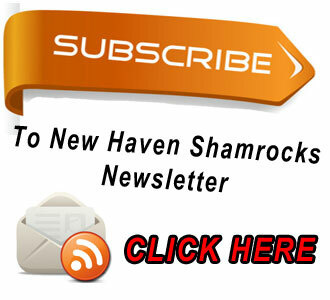 - On November 24th, 2010 Rachel Steinhoff began her basketball career for the Lady Shamrocks scoring 16 points in her first Varsity game as freshman. Steinhoff enters her senior year as a three year starter, having started all 90 games. 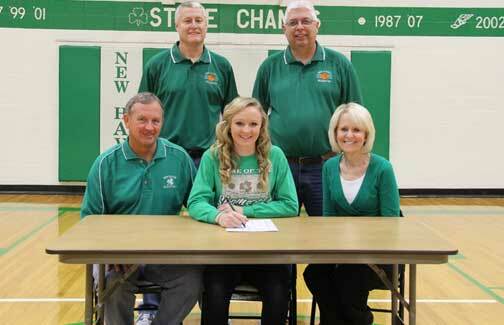 “It has been a dream of mine forever to play basketball at the college level,” Steinhoff said. Her dream will become a reality next year after signing to play for the Truman Bulldogs where she will continue her basketball career. Montgomery City, Mo. 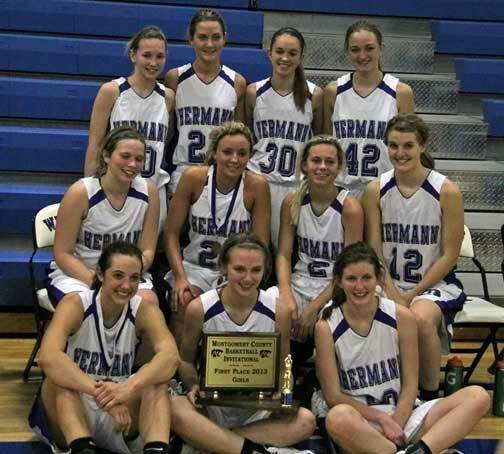 - Friday night the Hermann Lady Bearcats captured their third straight Montgomery County Tournament Championship, defeating Fulton 62-47 led by tournament MVP Karinne Lane, scoring 10 points and seven assist along with four players hitting double figures. Montgomery City, Mo. 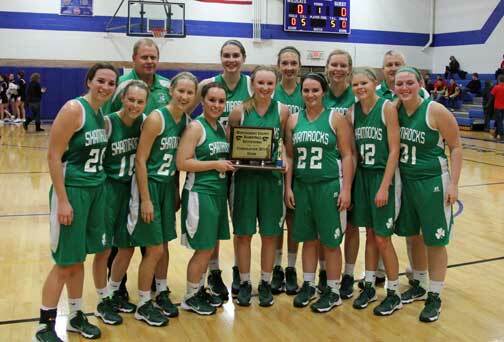 - Friday night the Lady Shamrocks upended the Clopton Lady Hawks 47-35 in the Montgomery County Tournament, winning consolation for the fourth straight year. 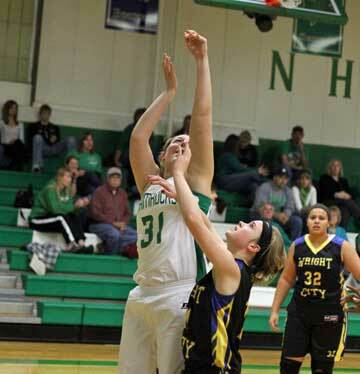 Led by Rachel Steinhoff’s season high 18 points and 10-12 shooting from the line, New Haven stepped up the intensity on defense in the second half, holding Clopton to just 14 points. Kayla Meyer puts back one of her two offensive rebounds, scoring six of her 10 points in the first quarter. New Haven, Mo. - New Haven begins the 2013-2014 season with unfinished business after falling short the past two years in the Class 2 State Championship finals. Monday night they kicked off their season, rolling over Wright City 57-21. 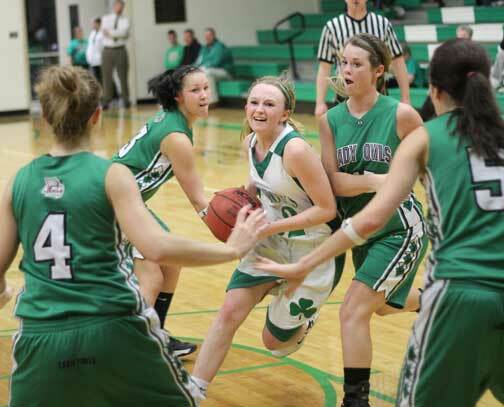 Senior point guard Rachel Steinhoff led all scores with 16 points, playing just 20 minutes. Senior forward Kayla Meyer was perfect from the field (4-4) and 2-3 from the line, hitting double figures with 10 points. New Haven, Mo. - Rachel Steinhoff is officially off the basketball market after signing a letter of intent to play at Truman State University on a full scholarship for the 2014 - 2015 season. New Haven, Mo. 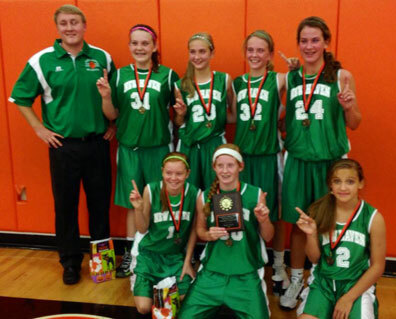 - It was upset city at Owensville's 8th grade girls basketball tournament on Thursday. Lauren Gerlemann led all scores with 10 points, seven of them coming in the second quarter where New Haven outscored Hermann 11-5, after only scoring one point in the first quarter. Coach Brian Abbott talks to his team during a time out. Columbia, Mo. 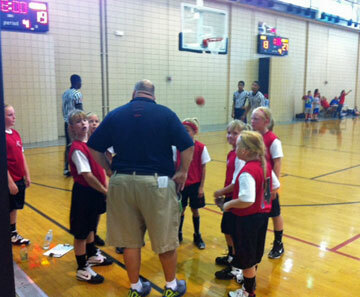 - Two weekends ago a group of 4th grade girls competed in the Show Me State games and this past weekend Coach Brian Abbott took a feisty group of 3rd graders from New Haven. Brenna Langenberg, MacKenzie Wilson, Lucy Hoener, Brooke Vedder, Emma Rohlfing, Ryan Stutzmann, MacKenna Tyree, and Payton Sumpter were the eight girls who called themselves, "And 1". The weekend began with pool play on Saturday, which determined where they would be seeded in Sunday's single illumination bracket. The team consisted of Madison Langenberg, Maya Widemann, Ellie Westermeyer, Emma McIntyre, Maria Sheible, Casey Jo Baker, Payton Burchart, MacKenzie Gerling and Grace Faris. Columbia, Mo. 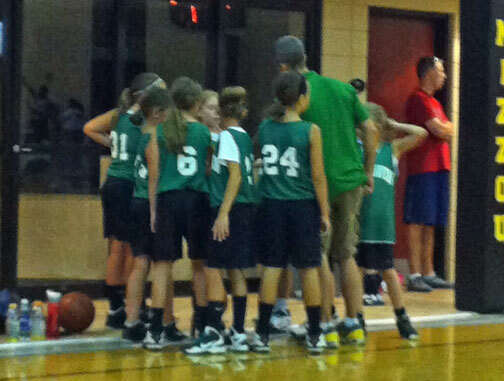 -Nine future lady shamrocks competed in the Show-Me-State 4th grade basketball division last weekend in Columbia, Mo. Coach Tracy Langenberg said, "Our girls played hard all weekend and competed against some very good select teams." New Haven, Mo. 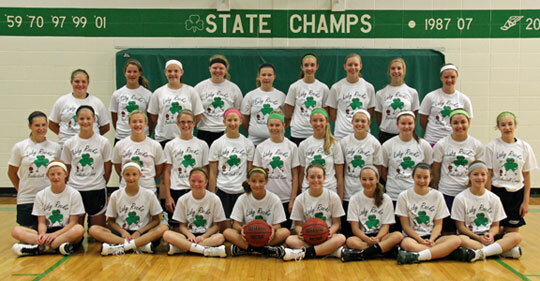 - Thursday, Varsity Girls Basketball Head Coach Dough Peirick wrapped up his second week of summer basketball camp for eighth to eleventh graders after camp for younger aged players in late May. This was Coach Peirick's first time hosting camp as head coach after leading New Haven to it's second straight trip to the State Final Four.